Microsoft recently unveiled a major update to its Office Web Apps that allows for real-time coauthoring functionality across its various apps including Word, Excel, and PowerPoint. This "same time" authoring can now be brought into ProtoSphere on our Media Board surfaces, thanks in part to the new web browsing feature we added to our 2.3 release. The feature peek video below shows this in action. Let us know what you think. The Inside Sales Representative is an integral part of ProtonMedia’s sales team and is responsible for lead generation and tracking these leads throughout the sales process. The person in this role works closely with external sales representatives to cultivate leads through targeted cold calling and email campaigns, following up on trade show leads and inbound product and information requests. In addition to lead generation, he or she creates and nurtures sales leads in a multiple-touch environment, providing product information and demos to prospects and new customers. The Internal Rep qualifies all sales opportunities, based upon specific standards, by obtaining company information, potential use cases, and on occasion, arranging product demonstrations before sharing the lead with the external sales representative. He or she also works closely with Marketing to support various marketing initiatives and execution of the marketing plan in able to ensure proper handling of inbound leads generated by marketing strategy execution. Compensation is uncapped and is based on a combination of a base salary and commissions on all successful sales. Promotion opportunities are based on skills, development and goal achievement. 3-5+ years performing lead-generation and inside sales functions within an IT/Software product and services environment. Apply via our LinkedIn posting. This month's issue of T+D Magazine, ASTD's flagship journal for training industry news, features an article about PPD's innovative thinking and approach to meeting their training obligations through the use of ProtoSphere. In describing some of the positive feedback survey respondents have had on the software, the article quotes Mike Wilkinson, executive vice president and chief information officer, as saying, the "3-D virtual training/collaboration technology improves the cost-effectiveness, speed, and accessibility" of their training. The article goes on to talk about the way training is being delivered in the platform, how trainers themselves have become accustomed to it, and the business structure that was put in place at PPD to support their various blended learning initiatives. The full article is accessible (with a subscription) from the ASTD website . On Friday we learned that ProtonMedia and PPD won the Gold award in the 2013 Brandon Hall Excellence in Learning Awards. 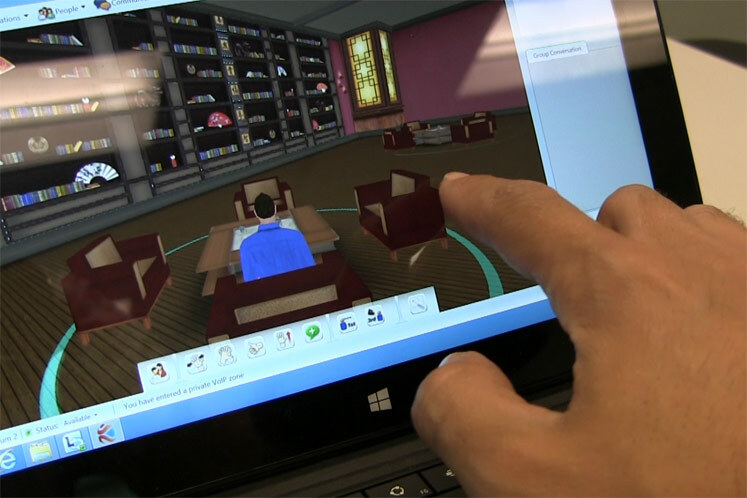 Often referred to as the "Academy Awards" of the learning industry, we won in the Best Use of Virtual Worlds for Learning category with our joint submission of PPD® 3D. The list of winners was announced during a web conference by Brandon Hall Group CEO Mike Cooke, COO Rachel Cooke, and VP of Corporate and Product Development Claude Werder. Each entry was judged by an international panel and awarded based on how well they met the needs of the program, their overall design and functionality, how innovative they were, and what were the measurable outcomes and benefits. As many of our blog followers know, PPD, in partnership with ProtonMedia, developed PPD® 3D on top of the ProtoSphere platform, allowing PPD staff to engage in highly social, interactive and visually appealing 3D virtual spaces and was implemented for their Clinical Foundation Program. The virtual training solution has eliminated travel costs, yet provides an enhanced level of learning engagement. Within the first six months of deployment, the application had paid for itself in travel cost reductions and to date has saved the company more than $2 million. PPD is expanding use of the platform for training and collaboration sessions between sponsors, CRO and site staff. Today PPD and ProtonMedia put a press release out about the news. You can view it here. A number of blog posts by various authors here at ProtonMedia have provided answers to the oft-asked question by the ProtoSphere uninitiated - “Why 3D?” Higher engagement levels, better retention of information, improved knowledge transfer, less social imposition than using video/telepresence, etc. in addition to it just simply looking better than 2D web collaboration have all been articulated on these pages. Well, here’s another “Why 3D?” reason that seems to be emerging from our customers – Shared Situational Awareness. I’m not sure exactly when, but the concept of situational awareness emerged out of the military community where giving a soldier or her command chain a complete sense of what’s going on right now and how we arrived here (e.g. the “situation”) could often mean the difference between a decisive victory and something bad happening. We've had a number of customers over the years, especially systems integrators (who are often working on projects they can’t tell us anything about) talk to us about so-called “war-rooms” in 3D environments which could be visited by multi-disciplinary teams of specialists to collaborate interactively with their various streams of content in hand - virtually of course. We showed off one of these war-room virtual spaces a while back in a public demonstration with Polycom where we fed in a live, interactive 3D virtual (Google) map of a hot zone rendered on the floor, streamed in a couple feeds of live video from the field, had a couple video conferences from room/telepresence systems and access to Microsoft SharePoint data repositories. Voice, IM and video were also supported by ProtoSphere leveraging enterprise unified-communications plumbing – Microsoft Lync in this case. In addition to military there are known use-cases for war-rooms in crisis management, law enforcement, disease and pandemic management. But last week a customer asked me about using ProtoSphere for IT Network situational awareness. They asked me to visualize bringing a virtual object into ProtoSphere which is a 3D representation of intrusion log information from SNORT. By the way, SNORT is the open source network intrusion prevention and detection system created by SourceFire, who, interestingly, a couple weeks ago announced their intention to be purchased by Cisco Systems. Situational Awareness is a big deal for modern IT security. Cyber-crime, cyber-espionage and cyber-terrorism are becoming the new battlefield for the 21st century. Having spent a chunk of my career in networking and IT security I know how complicated it is to pinpoint and correlate, in real-time, something unusual in a SNORT log or alert with other behaviors that may be going on in your network (e.g. the “situation”) in real time. Most of this time these feeds from various IT systems (SNORT, network admission control devices, MDM, firewalls, gateways, servers, switches, etc.) are textual streams from the various devices and it takes forever to correlate and spot a series of events that may represent a credible threat. Oftentimes this can only be done in arrears (e.g. forensics) after it’s too late and the bad guys have done their damage. And it’s even harder to quickly share one IT analyst’s view of the “situation” with those in the IT command chain or in the decision-making halls of the business responsible to make a risk-mitigation decision. One thing that a 3D virtual environment is great at is giving a very visual emphasis to events – for example making it a bold color or animating it. We have the ability to allow an analyst choose (e.g. touch or click) an emphasized event to get “teleported” to another area, room or view representing a drill-down which has other 3D visual representations of resource state information that is occurring – right now. And IT analysts managing other enterprise systems may be standing by in that virtual room to assist with a more granular evaluation of the risk, as necessary- a lot faster than calling, emailing or IMing. ProtoSphere can allow specialist IT analysts to have access to different views (in various rooms) or provide a virtual dashboard zone where business executives take decisions on next steps. Labels: Data visualization, ProtoSphere, Reggie Best, situational awareness, Why 3-D? Sam Batterman, Microsoft Life Science Specialist (Data &Visualization) discusses the benefits of the latest innovations from Microsoft and ProtoSphere to Life Sciences organizations. With the touch technology of Windows 8, it’s quicker and easier to navigate using devices of any size ranging from small tablets to large Perceptive Pixel displays. 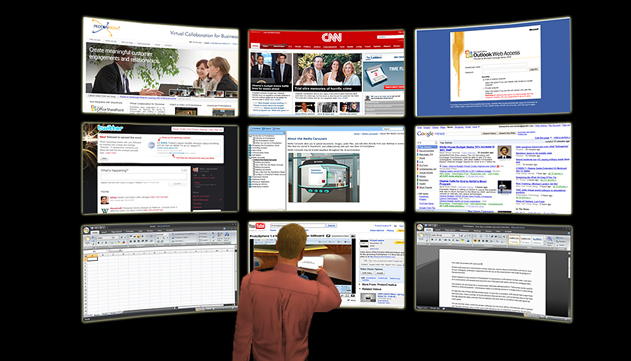 The combination of this screen touch technology on any size surface and ProtoSphere's persistent, virtual 3D collaboration environment offers broad support and an effective, lively collaboration setting for clinical research training, research and development, project management, HR onboarding and clinical trial monitoring. By leveraging Microsoft technologies already in use, enterprises including life sciences organizations, increase cost efficiency and productivity. ProtoSphere version 2.3 also adds web page browsing on Media Boards, seamless integration with the latest Microsoft business technologies (Lync 2013, SharePoint 2013), and live, synchronized video conferencing with Polycom RealPresence integration. Windows 8 touch support in ProtoSphere is currently being demonstrated at the DIA 2013 Meeting up in Boston this week. ProtoSphere is breaking new ground as the first and only immersive 3D environment for business to work on mobile devices. Watch how easy it is to navigate and interact on ProtoSphere with touch enabled controls using iPad. Touch enabled controls and a new user interface bring a remarkably tactile and natural user experience to each 3D room. Microsoft® Lync® 2013 support. The ProtoSphere iPad app seamlessly bridges the Apple tablet and Microsoft unified communications worlds via the integration of the ProtoSphere iPad iOS app with Lync 2013 for persistent voice communication, instant messaging, and presence so you can talk, chat and collaborate in a small group, one on one, or in a mass presentation/town hall event. Same Content View as Desktop. ProtonMedia leverages the power of its media boards to present the same amount of content to an iPad user as a notebook or desktop user attending the same virtual meeting, despite the smaller iPad screen size. Access to SharePoint Boards. SharePoint Boards provide iPad users with access to their content stored in SharePoint document libraries. Ability to play Adobe® Flash® stored video on Media Boards using ProtonMedia’s PS3D™ transcoding technology. Higher quality graphics with improved graphics rendering presented on the vibrant display of iPad immerses you in a high performance virtual workplace ideal for learning and exchanging information. ProtoSphere for iPad works with a 3.0 server back end. ProtoSphere 3.0 runs on iPad 2, iPad with Retina display and iPad mini models running iOS version 5 or greater. ProtoSphere 3.0 is interoperable with Windows-based clients running version 2.3 of the ProtoSphere desktop application. The ProtoSphere for iPad app will be available in the Apple iTunes® Store this summer. Every year members of the Drug Information Association (DIA), a nonprofit organization with about 18,000 members in 80 countries, meet to learn and share how to use innovative technology to advance public health. This year, over 7000 life sciences experts, thought leaders, and innovators are expected to attend the meeting next week in Boston from June 23-27th. ProtoSphere will be one of the featured Windows 8 applications to be demonstrated at the Intel device bar located at the Microsoft booth, # 623. On display will be ProtoSphere’s latest innovation, support for Windows 8 touch. With Windows 8 touch and ProtoSphere, you can interact in a touch enabled, 3D collaboration space on everything from large Perceptive Pixel displays, down to tablet form factors like Surface Pro. The ProtoSphere and Windows 8 demonstration includes a preview of ProtoSphere 2.3 which adds co-browsing on Media Boards, seamless integration with latest Microsoft technology (Lync 2013, SharePoint 2013), and live video conferencing with Polycom RealPresence integration. If you're at the meeting this year, stop by the Microsoft booth and try the touch enabled demo of ProtoSphere for yourself. I had the opportunity recently to speak with two different customers, both from completely different markets, about their desire to use ProtoSphere to deliver learning content to their employees in the form of video. As chance would have it, an article in this month's Elearning! Magazine covers that very topic. The article quotes a recent study done by the Aberdeen Group showing that companies who use video as a tool in delivering training content are doing a much better job at reaching their organizational goals and keeping learners engaged. According to the study, 59% of organizations surveyed are currently using video content as part of their learning strategies. This; can take the form of internal videos, external, highly produced videos, or even video conferencing. In speaking to our customers about this, ProtoSphere's support for video playback is an important feature for them, especially when used in the context of a learning engagement. They want their learners to be able to attend a virtual learning event facilitated by an instructor, have them go off and watch a video or two (maybe even have them watch it together), and then come back to the classroom for followup discussions - all within the same platform. Sixty two percent of our own customers surveyed place a high value on this ability. Truth be told, it's one of the reasons we've worked so closely with Polycom recently to pull live video conferencing into ProtoSphere and have that available as another option. Stored video, live streaming video, video conferences, even videos from YouTube, are all capable of being broadcast within our persistent 3D work spaces. The full article on the benefits of using video content for learning is available on Elearning! 's website. I’m looking forward to being a panelist again at this year’s Phorum conference on March 21 at World Café Live in Philadelphia. We’re hoping to sell out the venue like we did last year, so make sure to reserve your ticket today! The Phorum is a great opportunity to see some of the nation's top enterprise technology thought leaders discuss disruptive trends and technologies impacting the way businesses operate and compete in the marketplace. Keynote speakers include top level executives from Salesforce.com, the CIA, SAP, and Forrester. 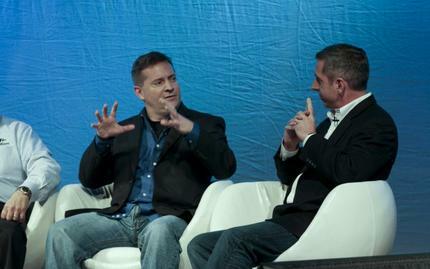 Yours truly along with Bob Maul, CEO of Artisan Mobile at last year's Phorum. This year's conference will focus on harnessing new technologies in the areas of big data, mobility, and social computing. You can view the full agenda here. The event will be held on March 21, 2013 at the World Cafe Live on Walnut Street. Lync Conference 2013: That's a Wrap! As the Lync Conference wraps up this week, I wanted to take a moment and thank the Microsoft Lync team for having us at the show. One thing is very evident - The Lync partner ecosystem is very much alive and bursting with unique and creative solutions. It is amazing to me seeing all the innovation brewing around the Lync platform that Microsoft has created for smaller software companies like ProtonMedia. We posted this video up on our website earlier in the week, but I wanted to call it out here as well. This is a case study video that Microsoft filmed about us and ProtoSphere, and shows what we're doing with one of our longest running customers, Merck and Co., Inc. I'm very proud of all the work that has gone into this newest version of ProtoSphere and I'm looking forward to what the future has in store for our Microsoft partnership. We announced the news of the availability of ProtoSphere version 2.2 in a press release today, so I will turn your eyes to that for more details on what we have in store. ProtonMedia, the leader in 3D virtual collaboration, announces the availability of Release 2.2, of its award-winning ProtoSphere virtual collaboration cloud. This latest release adds fine-grained moderator controls and enhanced usage metrics reporting for corporate learning applications. And for enhanced collaboration uses cases like project management, ProtoSphere 2.2 adds a broadcast-style town hall presentation mode supporting up to 250 users plus the ability to view and remotely control presentation content while performing other activities during a session. These enhancements further the immersive experience of 3D virtual meeting places resulting in an elevated level of productivity for users. ProtonMedia will be demonstrating ProtoSphere Release 2.2 at the Microsoft Lync Conference 2013, February 19-21 in San Diego, CA. ProtonMedia’s continued collaboration with Microsoft’s business productivity technologies provides a unified environment of communications and collaboration tools presented to users in a seamless, rich 3D environment for a more engaging environment that expedites and improves learning. “Release 2.2 builds on the immersive, more engaging user experience which results from combining ProtoSphere with Microsoft unified communications. Continuing this vision, we are working to bring Lync 2013 and mobile device support to ProtoSphere in a future release,” said Ron Burns, ProtonMedia CEO. 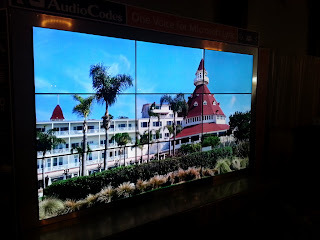 Next week we will be in San Diego from February 19-21 for Microsoft's first conference dedicated to Lync. If you will be attending, stop by # K11 for a preview of ProtoSphere 2.2 which furthers the immersive experience of our 3D virtual environment and Microsoft unified communications. You may even get a sneak peek at what we're doing with ProtoSphere on the iPad. And, don't miss our CEO Ron Burns' presentation of ProtoSphere with Lync during the Apps Track breakout session #4, "Show & Tell: Communication and Beyond" in the Stuart Room on Wednesday from 2:45pm to 4pm. More to come from the show! It's been an exciting week for us here at ProtonMedia... We started off at the TEAMPolycom event in Vancouver, showing what we've done to bring live video conferencing into ProtoSphere; we received wonderful news that we were the finalist in Polycom's App Developer Contest; and we presented ProtoSphere and its integration with Lync to a group of technology customers at one of Microsoft's New Era of Work launch events series in New York City; oh, and did I mention we launched our new website and branding and moved into a bigger office space? So with all that, I thought it fitting to end this week with a new feature peek video. Something that we've been working on for a while that I think a lot of our training/learning focused customers are going to appreciate - a remote control for Media Boards. We just received some good news here at Team Polycom 2013. Our ProtoSphere solution received a finalist award from Polycom in its first App Developer Contest! Polycom's App Developer Contest challenges companies to submit solutions that extend the value of the Polycom RealPresence Platform using open APIs. Winners were determined based on five criteria: commercial applicability, user experience, productivity, third-party application integration, and innovation. This week we're north of the border at Team Polycom 2013 to share some of the latest work we've done in ProtoSphere. Stop by booth #36 (we're the ones with the avatars!) and see how we've integrated Polycom RealPresence Video into ProtoSphere. I also want to take a moment to thank Peter Huboi over at the Polycom Community blog for posting some information about ProtoSphere in their solution showcase. There's some reading material that goes along with it that talks about the integration and what it means for our customers. In less than a week we'll be off to Vancouver for Team Polycom 2013 where we will be debuting Protosphere 2.2—highlights include integration with Polycon RealPresence Video Solutions, the ability to display web pages on our versatile content displays, and new 3D locations designed to support hundreds of participants. 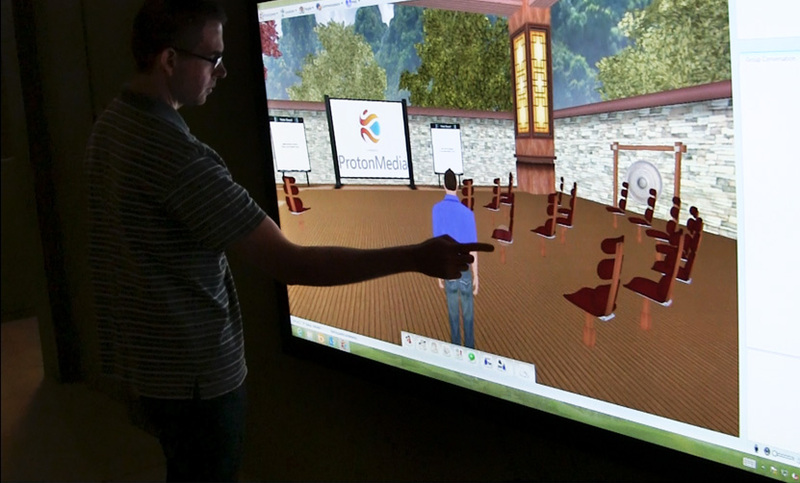 If you are planning to attend, stop by the ProtonMedia booth, #36, to preview the latest Protosphere release— the first 3D virtual environment to offer integration with Polycom RealPresence Video solutions. See how to conduct real time, engaging video conferences in our 3D meeting rooms. ProtonMedia was featured on a recent broadcast of Critical Mass for Business, an Internet radio show that conducts revealing interviews with CEOs and business owners. Our CEO Ron Burns explains persistent, engaging, 3D immersive virtual meeting spaces for business collaboration to Ric Franzi of Critical Mass.